After successfully calculating your rack, you can add it to your cart. Product Information "Custom CD / DVD Rack"
Do you have a specific system in mind for organising and storing your CDs and DVDs? Pre-made racks don’t always suit your individual needs and vision, so why not consider a Custom CD/DVD Rack? Prices for a custom rack begin at €22,and vary according to the size and features you are looking for. Best of all, there’s no need to wait to find out how much your dream rack will cost! By using our customisation tool, you can calculate the exact price and, if you’re satisfied, add it straight to your shopping cart so that we can begin making it for you as soon as possible. When you are using the customisation tool, please remember that all measurements are in centimetres. Due to the nature of acrylic panels, some combinations of dimensions (eg, a case which is 75cm tall and 75cm wide) are not possible. Making cases with these combinations would be very likely to result in breakages, which of course we work hard to avoid. Other combinations are possible, but may result in a different shipping option being used (our standard shipping option can only handle packages of certain sizes). If you select a combination of dimensions that could cause problems, an error message will appear. You may then adjust your chosen dimensions so that you can go ahead and order right away. If you have any questions or problems, please feel free to write us an e-mail on info@sorashowcases.com and one of our friendly staff members will be able to help you out. Your CD, DVD or Blu-ray-Rack will be made just the way you want it to be. In order not limit your creativity you are free to design and order every kind of CD/DVD rack you like. This means you can also enter combinations of dimensions and compartments (shelves x columns) that will resould in a custom rack that can actually be to small to house CDs or DVDs. To prevent that, keep the dimensions of the standard CD, DVD, and Blu-ray-cases in mind. Step One: Decide how many shelves you want, and select that number from the drop-down box. Step Two: Decide how many columns you want, and select that number from the drop-down box. This shows how many compartments each shelf will be divided into. For example, if you select 1 column, then there will be no divider in each shelf. If you select two columns, each shelf will be divided in half, and so on. Step Three: Decide whether you want your rack with or without a front panel, and select the appropriate response from the drop down box. Adding a front panel costs a little extra, but will help protect your CDs and DVDs from visitors, children and pets. Step Four: Choose the type of back panel you would like for your rack: transparent, reflective or black. Think carefully, because this will affect the appearance of your display! You may like to look at the sample pictures provided on this website to get an idea of what the different back panel options look like. Step Five: Decide how wide you want your rack to be, and select the appropriate number from the drop down called ‘Width (Outside)’. Then, select how tall you want your rack to be, and select the appropriate number from the drop down called ‘Height (Outside)’. Step Six:Decide how deep you want your rack to be, and select the appropriate number from the drop down called ‘Depth (Inside)’. Step Seven: Click on ‘Calculate Now’ to produce a list of the specifications for your custom rack. If there is a problem with something you have entered, an error message will appear, explaining what you need to do to fix it. If everything is fine, you will see a summary which includes the dimensions of your rack, the number of compartments it will contain, and the price. Step Eight: If you are ready to order, go ahead and click on ‘Add to Shopping Cart’, then click on ‘My Shopping Cart’ to review postage costs and check out. Alternatively, you are welcome to adjust settings as many times as you like until you find the custom rack that perfectly suits your needs. Step Nine: We will build your rack and ship it to you in approximately five working days. It will arrive as an easy-to-assemble kit (with illustrated instructions included) and requires no tools or adhesives to put together. And remember: If you have any difficulties in the course of ordering a custom case, just call Sora Shop on +49 36921 91411 or email us on info@sorashowcases.com We’re always happy to help! The input dimensions for the configuration tool are highlighted in the above shown schematic representation. Please note, that width and height are applied as the outside dimensions of the cabinet whereas "depth" represents the inside depth. The difference between outside and inside dimensions depend on the number of shelves and columns you select for your custom CD rack. You can choose between different designs of the back-panel (black, transparent or reflective) as well as you can order your individual showcase with or without a front-panel. The number of shelves as an input field means how many horizontal layers your rack is supposed to have, whereas the number of columns equals the number of vertical units. The total number of shelves as a result of your inputs (number of shelves * number of columns) will be displayed below the input fields of the construction tool. 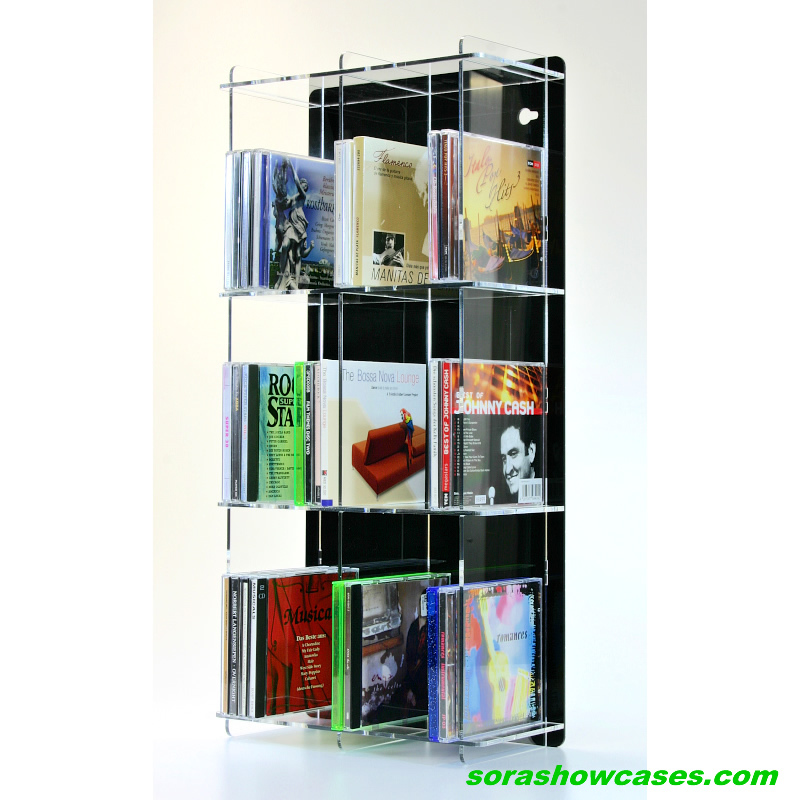 All custom CD and DVD racks are based on the proprietary sora connector system. They are delivered as an easy to build up construction kit. The parts of the construction-kit are joined with acrylic splines. Therefore you won't need any additional tools or adhesives to build up your rack. For further information about the construction principle of the acrylic rack, please check our construction manual . The front-panel is made of crystal-clear 3 mm thick transparent acrylic and can be attached to the rack by hook-mounting. The side-panels of the rack have an acrylic hook, which is designed to hold the front-panel. If you order your CD/DVD rack without a front-panel, then the side panels will have no mounting hooks. If a certain combination of settings is not possible, the online configuration tool will display one or more error messages. Please change the settings of your custom CD/DVD rack according to the error messages. If your desired dimensions exceed the ones applicable to the online configuration-tool, please send us your request via e-mail. We will then check the feasibility of your custom product and quote you an individual price in case of confirmation. 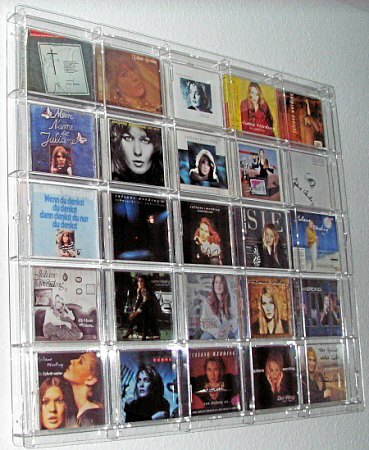 links to "Custom CD / DVD Rack"
customer reviews on "Custom CD / DVD Rack"